This retelling of the hilarious monster comedy includes an eight-page insert of full-color images! 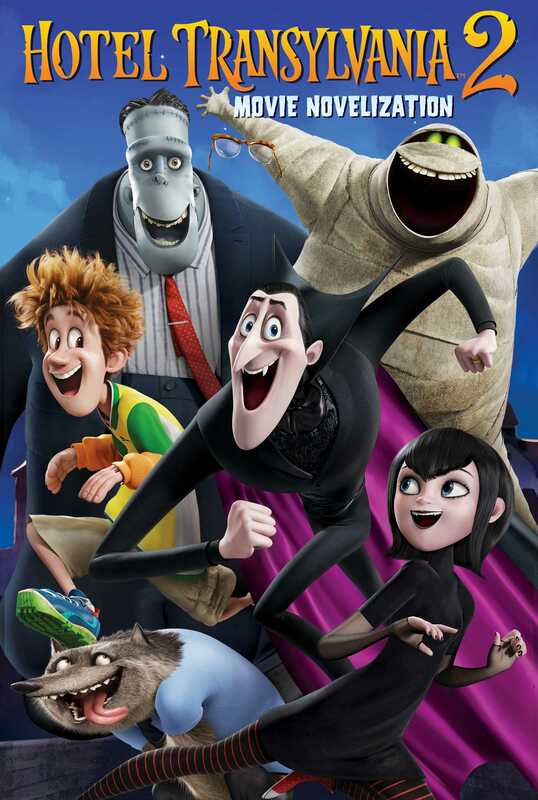 Everyone’s favorite monsters are back for another exciting adventure in Hotel Transylvania! All fathers get emotional on their daughters’ wedding days. But on his daughter Mavis’s wedding day, Dracula was taking it particularly hard. When it was time for the ceremony, his three monster friends found him hiding in a closet. His buddy Frankenstein spoke to the closed closet door. The door opened. Dracula came out. He looked awful. His tuxedo was misbuttoned and his shoes were on his hands. He was a wreck. “Okay! Here I am! Stop yelling at me!” Dracula yelled. “I know that! It’s all good!” Dracula answered. All three monsters looked upward. Dracula was on the ceiling curled in the fetal position. “Drac, you know Johnny’s a great guy,” Frankenstein said soothingly. “Drac, the important thing is, right now you gotta be strong for your little girl. She’s gotta be scared too,” Frankenstein said. That did it. Dracula couldn’t let his beloved Mavy be scared, even for an instant. He floated down from the ceiling. “Okay. I’ll try. For Mavis,” Dracula said. Mavis was busy getting ready in her room. Her monster bridesmaids were helping her get ready when they heard weird wailing sounds in the hallway. “What’s that messed-up noise?” one of the bridesmaids asked. Dracula entered the room. His eyes were red and watery and his cheeks were streaked with tears. “Dad! Are you okay?” Mavis asked. Dracula tried to stay strong. Mavis looked at her bridesmaids. They nodded and all left the room. Mavis looked at her father, worried. “I never heard of that last one, but it sounds very helpful,” Dracula said. “But, Daddy, if I’m married, am I going to be able to do all that?” Mavis said. “You’ll do it together,” Dracula told her. Dracula turned into a bat, and his bottom lip started to quiver. Dracula immediately turned back into his human form. “I really am!” Mavis told him. “Then so am I, my little poisonberry,” Dracula told her. Then they walked out, arm in arm. At the wedding ceremony Dracula couldn’t hide his emotions. He had written a song especially for Mavis. “Where’s my little Mavy Girl? You’re my Daddy’s girl . . .
Because you’re Daddy’s girl . . .
Johnny stood at the altar with his backpack. The backpack was wearing a bowtie and held the ring for Johnny to give to his true love. Johnny’s clean-cut brother was a groomsman. Kent, tall and athletic, stood next to an odd-looking monster. He clearly felt a little confused and a whole lot out of place. Mavis’s bridesmaids stood on her side of the altar. Clarabelle, a monster with frog limbs, was next to Johnny’s red-haired sister. The shrunken head that lived on Mavis’s bedroom doorknob was there too, strung to a coat hanger. She had no body, so her matching bridesmaid dress hung on a small coatrack nearby. A little red-haired girl (another relative of Johnny’s) was a flower girl. She carried a teddy bear and a bouquet of flowers. Everyone said “Awww” as she walked down the aisle. But then a slew of wolf pups noticed the teddy bear and rushed in to pounce on it, shredding the teddy bear and flowers. The little girl was a disheveled mess as the ruined petals fell all around her. It was time for the bride to appear. Slowly, dramatically, Mavis stepped up to the end of the aisle. All eyes, monster and human, were filled with happy tears as they turned to face her. Dracula held back his own tears as she started down the aisle. Inside, he suffered. His little girl was getting married . . . to a human. He hid his feelings through the ceremony. When it was time for bride and groom to kiss, Dracula could no longer keep his terror inside. Using telepathy, he threw the shrunken head between them just as Johnny was about to kiss Mavis. Grossed out, Johnny opened his eyes. Dracula felt a little bad about ruining the moment, but not too bad. He gave in, saying, “Okay, one quick one.” They kissed fast before he could throw any other monsters at them. After the wedding a prickly monster hugged Johnny’s dad, Mike. It hurt. The cake screeched in horror as it was cut. The cut slice shrieked like a child separated from its mother. The monsters applauded wildly. Johnny’s family grinned uncomfortably while Mavis and Johnny fed each other tiny pieces of screaming cake. To end the magical evening, Dracula took out his ukulele and very, very, very slowly sang the ending of the song he’d written for Mavis and Johnny. Mavis ran from Johnny over to her father. She hugged him hard, letting her emotions show and her tears fall. Other monsters started crying too, including Bigfoot. His giant tear fell on Johnny’s mother, Linda, soaking her entire body.